In what way do public sector unions act as a check on the power of corporations? They are not negotiating against corporations; they are rarely competing with corporations (and certainly not in the case of the teachers’ unions); and corporate taxes do not provide the bulk of the revenues for state and local governments. corporations and militant workers have been neatly transmogrified into selfish taxpayers and greedy unions. My union sympathies are much stronger in the private sector than the public sector, primarily because I do indeed think the biggest value of unions is the fact that they act as a bulwark against unfettered corporate control of the political economy. But that doesn’t mean this is the only benefit of unions. I also value unions for moral reasons: workers should have the right to effectively bargain with management over wages and working conditions no matter who management happens to be. Taxpayers can act unfairly just as easily as any other employer. And I value them for purely economic reasons: workers should be paid decently no matter who they work for and unions help make that happen. And for reasons of solidarity: the death of public sector unions will only hasten the further demise of private sector unions too. And for reasons of partisan hackery: public sector unions provide considerable support for the more liberal of our two great political parties. There are some pretty reasonable arguments to be made against public sector unions, prime among them the fact that they exert a lot of control over the politicians who act as “management” in bargaining fights. To some extent this means they get to bargain against themselves, and taxpayers can sometimes end up with the short end of that stick (though see Jon Chait for the other side of this claim). For this reason, I’d support a ban on public sector unions contributing to political campaigns if the same rules applied to corporations and the rich. But they don’t, and they never will. 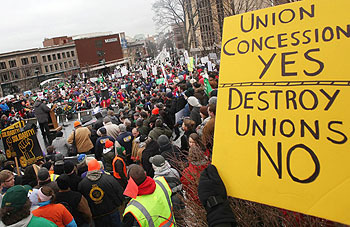 For better or worse, then, I support public sector unions as well as their private sector counterparts. It’s not a perfect world we live in, but bargaining for wage gains and decent working conditions is something that everyone should be allowed to do. Working for the government doesn’t suddenly mean that right should disappear.